H.B. Olsen’s and Gloria’s too. If you don’t come see me today, I can’t save you any time. Are you sure about the address or that it still stands? I didn’t see anything that looks like what’s in that picture on Street View. That funky little yellow building at 2112 was built in 1908 so that must be it, with bunches of modifications over the years. Is the place next door offering giggles for 5 cents? It looks like “ciggiies” to me cigarettes? Would that be for a pack or an individual rolled cigarette? Sorry I meant to spell CIGGIES not ciggiies! Giggles for five cents would be soooo Portland. I couldn’t resist snooping around about the history of this property (2110-2112 NE Alberta). Per Oregonian archives and PDX Maps, this business-residential property has had many other uses aside from H.B. Olsen’s watchmaking operation: restaurant & deli (1916), shoe repair shop where one of owners died of stroke on premises (1917-1922), “store” (1924), coppersmith’s shop (1924), barber shop (1925-26), “Alberta Food Lockers” (1948), “Bud’s Plumbing Co. (1956), upholstery shop (1983). The property was for sale and vacant for several longish intervals during 1960-64. It had a 2 BR, 2BA apt. upstairs. In 1920 a local court granted US citizenship to one H.B. Olsen (a Norwegian immigrant) in recognition of his service during WWI. Richard, how do you get to that info on PDX Maps? I seem to only find the basic; permits etc. I would love to know the steps you used to get all of that history. Thanks! Jane: Most of that stuff was from the “Oregonian Historical Archive” (Mult. Co. Library web site), i.e., searching on various combos of the address to glean things from the full text of old articles and mostly “business opportunity” classified ads. PDX Maps supplied just a few other details based on permits. so I walked over today to have a peek, and couldn’t find that address. It appears to be that the address discussed earlier for that ‘funky building’ is 2112, and the address next door is much lower and it’s for the VFW Lodge, which is a much later building. I’m not sure which building this is supposed to be pictured up above, unless it was across the street, and that’s now a vacant lot. Actually this building was bought by my Dad in 1968, and I’ve owned it since 1983. My parents had an upholstery shop (Don’s Upholstery) for those years in it, until they moved to Idaho. I know there has been three ‘remodels’ over the years, mostly in the 1940’s. I can see a building wall to the west of the picture that I didn’t know about, the Legion Hall was put in that lot, I believe in1954. The laundry to the east was put in around 1961, and they shaved off about 5 feet of my property to put in a boiler room. The lot across the street used to be Albina furniture, which was burnt down, I believe twice in the late 60’s. Aladdin Furniture next to it was part of the family that owned it. The lot was bought by Acme Glass and is still owed by them, though they closed the business about three years ago. Thanks for the details about the property, I also know that there was a man making cutting boards downstairs in the early 60’s and the apartment was a rental also. It becomes more complicated. 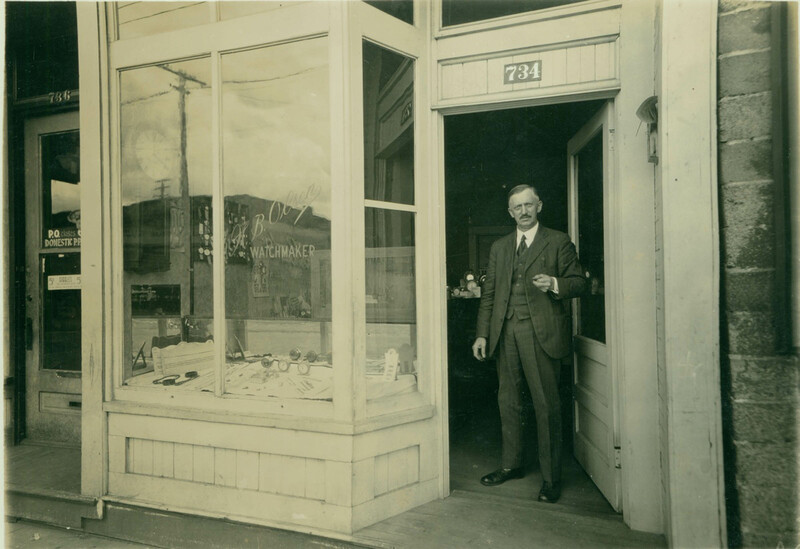 You caption the vintage picture of Mr. Olson’s watchmaking shop as at 734 Alberta, but it says 783 on the door. Libby, I’m not seeing 783. I see 734, and one can see that next door is 736….